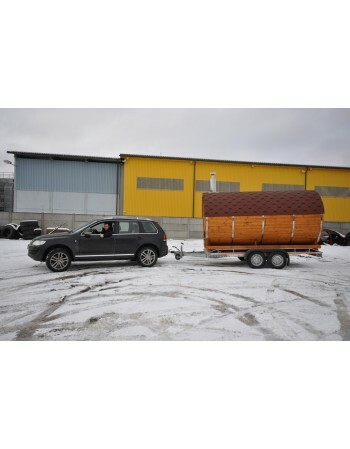 Outdoor mobile sauna could be made different length. 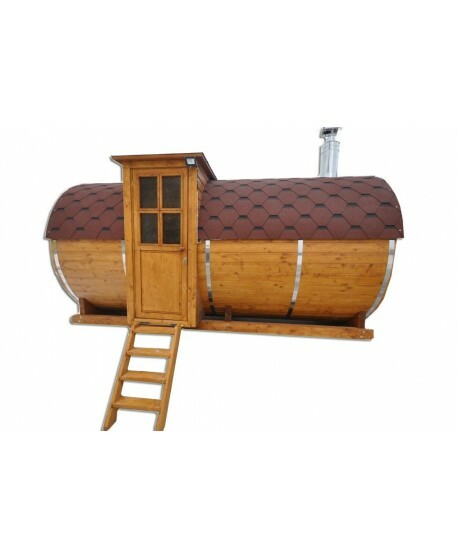 The starting price is for the standard model of spruce barrel sauna (dimensions:height 2,45m;width: 2,45m;length: 3m). The price will change automatically when selecting additional accesories from the menu bar. 1. The type of wood. Optional (spruce, larch, thermowood). 2. 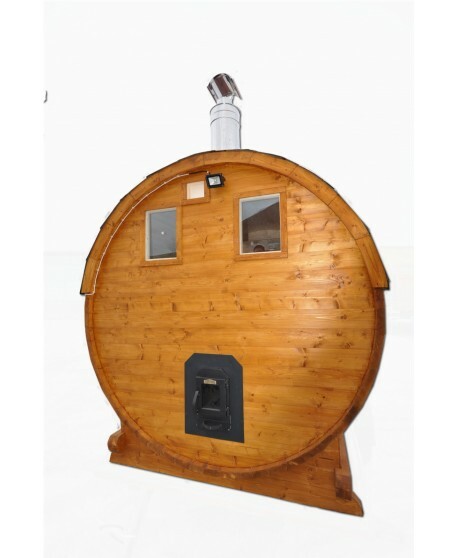 The oven is heated by wood (and the chimney) or electric oven. 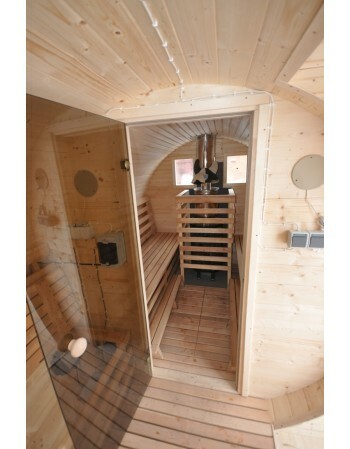 3. saunas length. Optionally (3 m, 4 m, 5 m). 4. 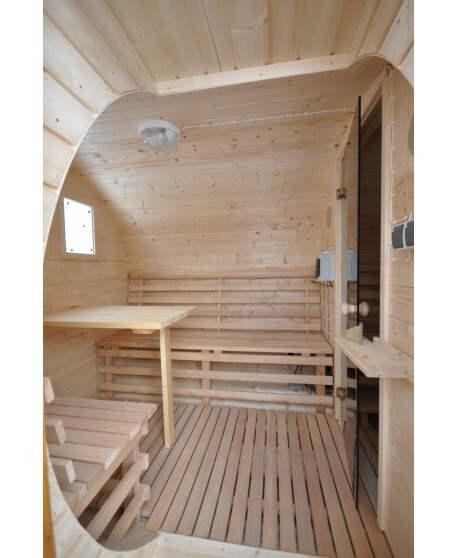 The seats – bunks in the sauna. 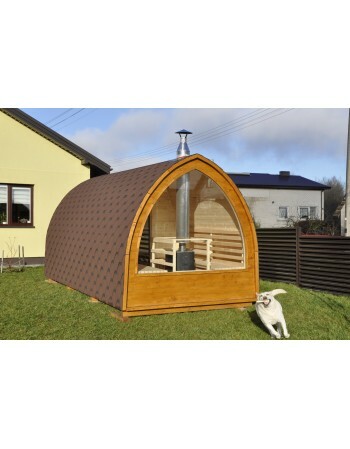 5. saunas height of 2.45 m / width 2.45 m.
6. 40 mm wall thickness (wall insulating is optional for extra price). 7. bituminous pavement tile roof. 8. 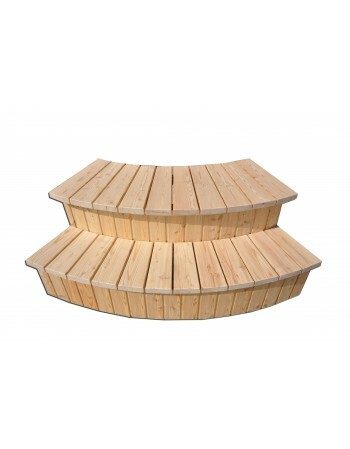 Wooden floor thickness: 40 mm. 9. 2 windows on the back wall of the sauna room. 10. A window in inside-door. 11. Entrance door with lock. 13. 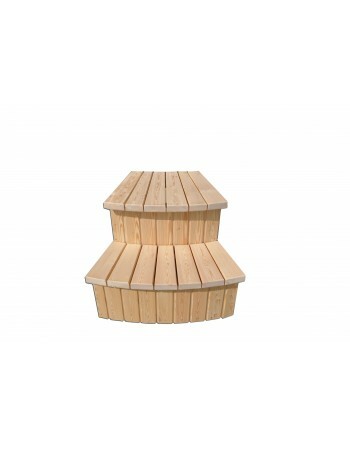 Heat-resistant protective wooden grates for oven. 15. Slot for electricity and electrical safeguard. 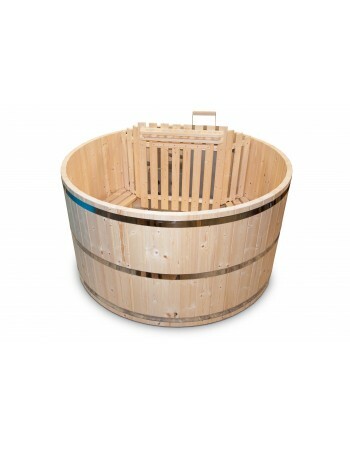 Barrel sauna - it's a barrel-cylinder form sauna, which both inner and outer trim is made entirely out of wood. 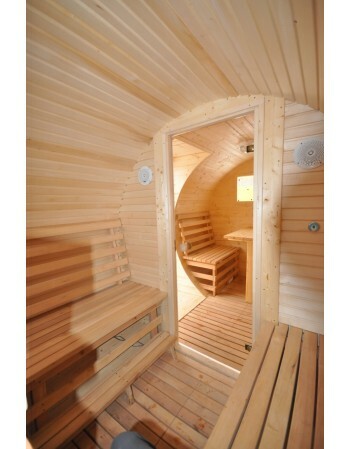 When heated the air in sauna circulates slightly better, but frankly it's just more a feature of a style. When ordering on our online shop you can choose from a 3-standard lengths barrel saunas (3m, 4m, 5m, but you can easily order individual dimensions also), with wood-fired oven with optional variant of puting furnace inside or outside the sauna or you can also choose excelent electric heater. You can also choose wall insulation, LED lighting, we can devide sauna in two or three separate spaces (shower, locker- or restroom, etc.). Your selected option can be painted in any color. We impregnate the outside of the sauna three times. 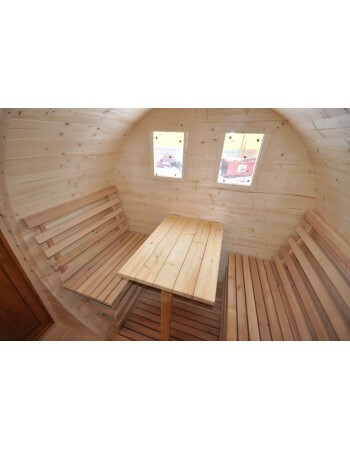 Please note that the sauna is like a small garden house, so customers often want specific individual nuances. We take care of this with great pleasure: we help and advise on any issue raised. If having various questions please contact us. 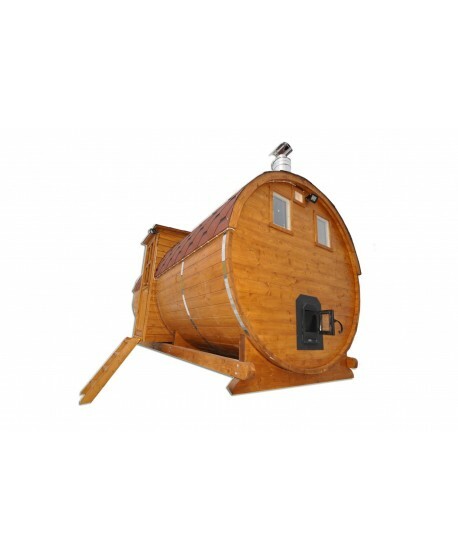 Our highly professional workers with experience over 10 years in the field of manufacture of hot tubs and saunas will produce the highest quality wooden barrel sauna , which you can carefree enjoy during both winter and summer. 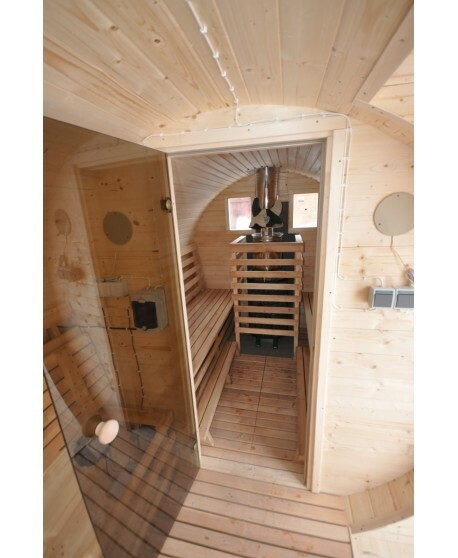 Speaking about saunas exterior, we use only the highest quality spruce, Larch and thermowood. 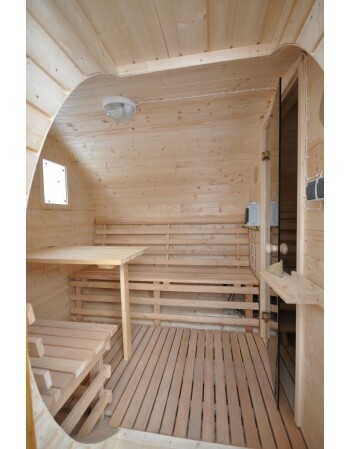 Interior details such as seats-bunks are made out of high quality aspen. 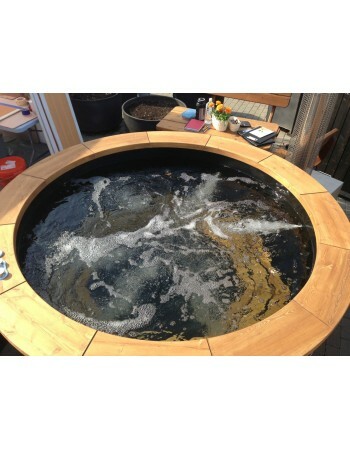 This wood is perfectly resistant to heat and moisture, retains its color and shape. 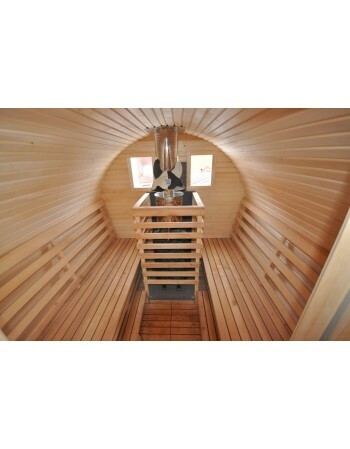 Because of these characteristics the sauna is longevous and high quality. 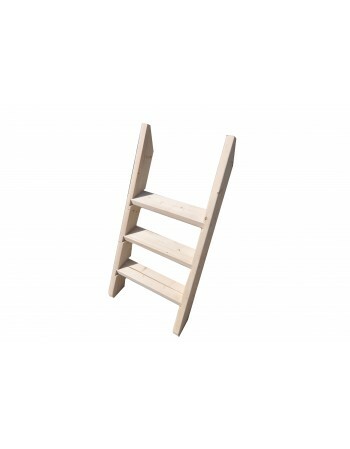 Highest quality means that the wood is solid, firm, properly dried and has no branches or growths in it. 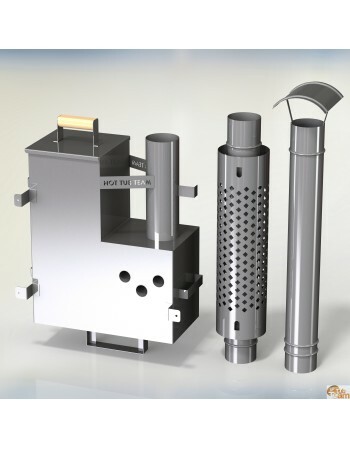 It is a guarantee of quality all around the world. We are manufacturers and not dealers, therefore we are responsible for all the quality of our products and give to every each of them 2 - year warranty. But in most cases waranty is provided for the whole period of use. 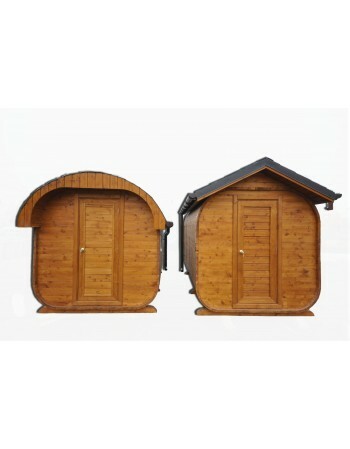 Therefore, you will feel comfortable and safe when buying any of our products. Firstly, it is necessary to build or to find a plain surface - lawn, terrace or another smooth pavement. This description gives you just some general information. The full and detailed manual of sauna is included after purchase. 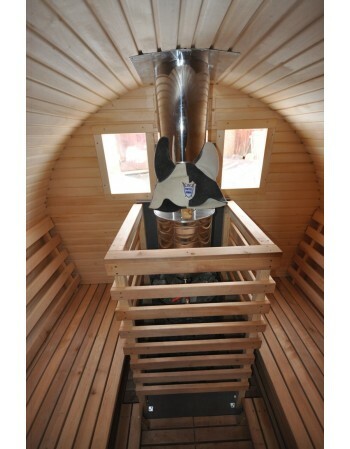 The two-year warranty is valid only if sauna during this period was used according to our manual. 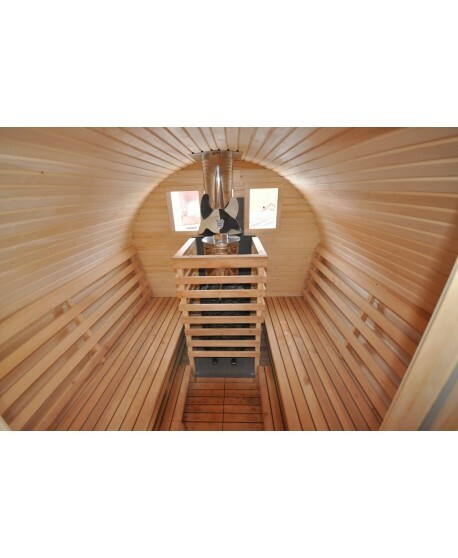 If you would apply for a warranty and after examination we would determine that the reasons that caused the damage was done by strictly violating the manual, we will not be able to provide you a repair or replacement of your sauna. We wish you pleasant moments and good health using our barrel sauna. If you have additional questions, please do not hesitate to contact us. 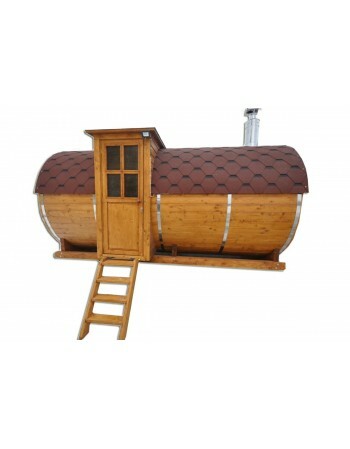 We'll be glad to help you and make the best sauna for you. 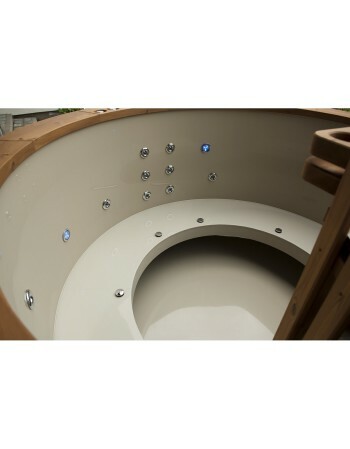 Water massage (hydro massage system) has 6 jets and are installed into hot tub walls. 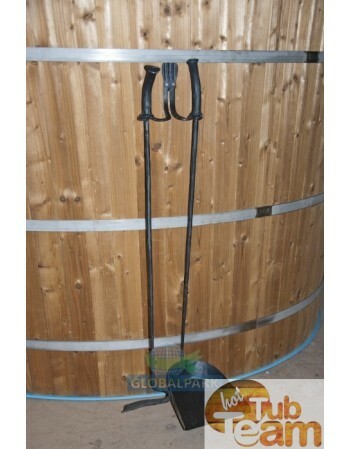 Ladder for hot tub is made of chosen wood. 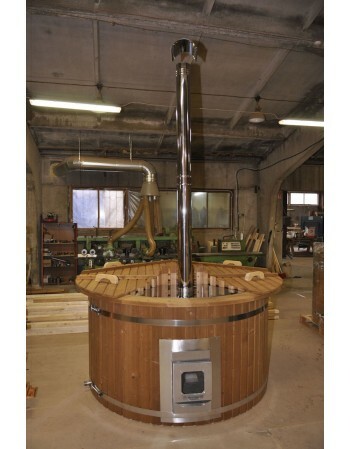 Internal stove 28 kW KL np-59 for hot tubs to heat the water. 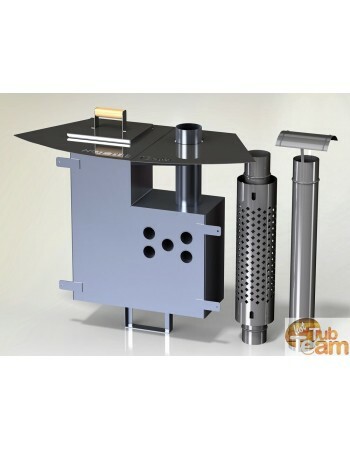 Logo on stove can be removed or we can make You logo. 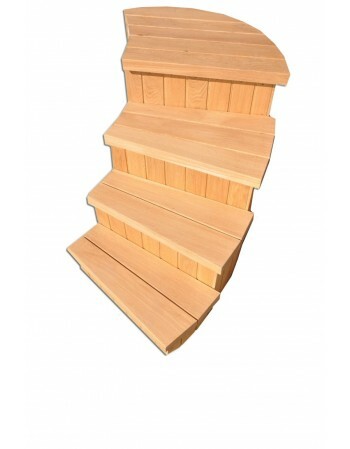 Type C stairs for hot tub is the biggest steps made of wood. 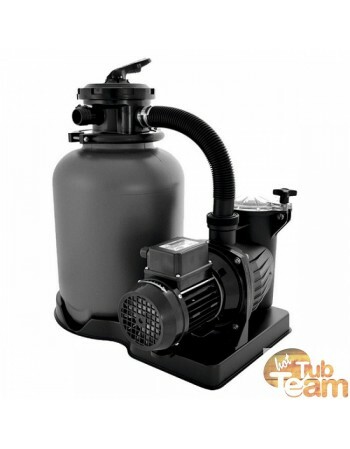 Water filtration system for hot tub is the most effective way to keep the water clean. Oval roof outdoor garden sauna made of pine wood.